There's an uprising; a new player has come to Pop Star. His presence will be felt, and his army will be unstoppable. Want in? 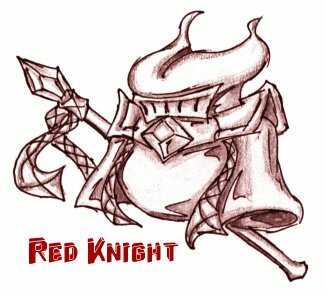 The Round Knight Recruitment is looking for worthy warriors to pad out the ranks. The masked swordsman has his own crew, The Meta Knights. A squadron of his own Red Knights will be gathered to combat their likes while bigger targets are taken on by the leader. Simply put, the question here is "If you could make a Meta Knight..." Note that it is a Meta Knight, not the. Ax Knight, Mace Knight, Trident Knight, and Javelin Knight are all soldiers who serve eponymous Meta Knight. The task here is not to make a mask wearing puffball with wings, no. You will build an army to rival his. Pick a weapon, design some armor, and make a soldier. But there's more to the stakes than that. You're Knight could be chosen to appear in an upcoming Rainbow Resort special event. Round Knight Recruitment ran from March till May, 2009.